C.H.I. 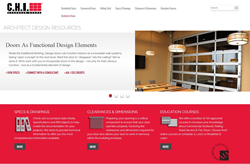 Overhead Doors recently released a new Architect Design Resources website. This site delivers new tools and easy access to product specifications, data, and drawings in multiple formats, including PDF, CAD, or BIM. "We wanted to design a site that, beginning with the main page, would provide the best user-experience and the up-to-date product information that architects need," said Joe Clark, Architect Consultant for C.H.I. Clearances and Dimensions configurator, which allows customers to easily request a drawing with critical dimensions needed for their specific project. Visit http://www.chiohd.com/architects to see this new website from C.H.I. Overhead Doors.